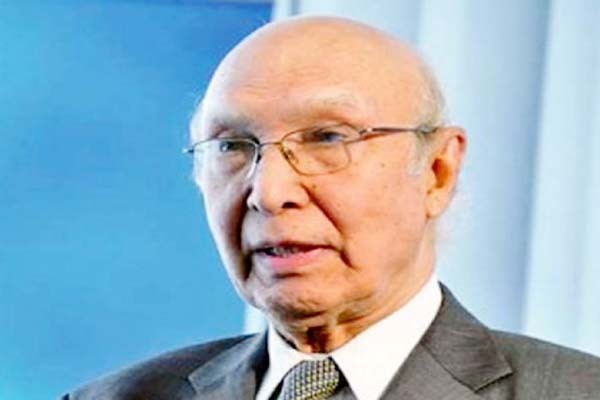 ISLAMABAD, June 19 (APP): Advisor to the Prime Minister on Foreign Affairs Sartaj Aziz Sunday reasserted that contours of Pakistan’s foreign policy to achieve economic stability and trade growth through vast regional connectivity have met success during the last two years. He said under the global realignment policies, Pakistan increased its trade and energy connectivity in the region, thus assuming the epicenter of colossal economic activities which would transform the facade of entire region. In an interview with the PTV, the Advisor defended the blueprints of the government’s foreign policy by saying that the country’s profile with regard to enhancement of its ties with the Central Asian Republics, China, the European and the Islamic countries have witnessed marked improvement. “Our brotherly and friendly ties with the Islamic countries, including Saudi Arabia and Iran, have enhanced. We have been maintaining a balanced policy and our role is very constructive,” he added. Sartaj maintained that Pakistan would not interfere into the internal affairs of the countries and that approach had gained global appreciation. it was going to play in the Shanghai Cooperation Organization (SCO). there were 117 drone strikes in the country, but due to the effective policy, those were reduced to three. national security and sovereignty which could not be compromised. With regard to Pak-India relations, the Advisor said Pakistan’s stance was very clear on the resumption of comprehensive dialogue which should include all the core issues of Kashmir, border and economic ties. He said India did not want to talk on the Kashmir issue and Pakistan was not in a hurry to hold dialogue excluding the core issues between the neighouring countries. “Tensions in the region does not bode well, so Pakistan is raising the Kashmir issue effectively at the international fora while maintaining a peaceful atmosphere,” he added. Pakistan and India simultaneously became members of the NSG. global scenario, Kremlin was also realigning its policy. Muhammad Nawaz Sharif in Ufa was very constructive. Both the countries were negotiating defence and trade issues. counter-terrorism measures and anti-drug issues were also underway. role in bringing stability in the war-torn country. ultimately the Afghan government had to continue it. countries existed in the last 70 years. required better management, he added. regard progress was being made. deep relations and certain issues could not affect them. in Saudi Arabia, he added. connectivity was not against any country rather it was aimed at generating massive and trade activities in the entire region. decades, the region would be the major trade hub. and regional ties, he added. would further increase in the coming years. did affect the country’s image. led to enhancement of its stature among the comity of nations.